Acid Freecell Solitaire including sound effects, animations, tracking of 9 statistics, fireworks and more. ADA cartoon Solitaire Game, the most popular and interesting picture-matching Game.Your goal is to remove all the matching pictures by inking pair of them. 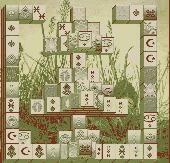 The deluxe cartoon Solitaire has Animated Background. Particular designed Boss key for you playing in office. Enjoy all wonderful pictures & animation! This classic peg solitaire game has a long history back to the 17th century. This classic peg Solitaire Game has a long history back to the 17th century. The object of this Game is to move the pegs until only one peg is left. A peg can move only by jumping over an adjacent peg, the peg being jumped over will disappear. Immerse yourself in the golden era of Art Deco in this solitaire game that will entertain everyone from the card-playing neophyte to the most skilled solitaire veteran! Classic Solitaire is the most popular solitaire game. Play the gr8test solitaire game on the planet. Play the gr8test Solitaire Game on the planet. Listen to the Star Spangled banner. 12 decks to choose from. The updated version has more custom card deck images. Play the Game during your free time. Reminds you what a great country the USA is. We highly recommend this Game. Go to the site.This simple Game was made in the greatest country in the world. Pentasol is a windows implementation of the classic Morpion Solitaire game. Free and fun solitaire game for the whole family. .
A fun and free solitaire game with Sternzeichen Krebs. .
Free solitaire game with two gameplays by ArcadeGamePlace. This is a solitaire game you play with a friend using TCP/IP or against the computer locally. Paraben's Marble Solitaire is a nice looking version of the classic peg solitaire game. Paraben's Marble Solitaire is a nice looking version of the classic peg Solitaire Game. Try to eliminate all but one marble by jumping over the other marbles like in checkers. Choose from 25 different boards. Choose your marble and board colors. Create your own boards. Undo moves if you make a mistake. Pretty Good Solitaire is the world's most popular collection of solitaire card games with 770 different games, from classic games like Klondike (the classic 7 pile solitaire game), FreeCell, and Spider, to original games found nowhere else. Top Solitaire is a free solitaire game with 500 classic solitaire games. Aloha Solitaire is a solitaire game with a hawaiian flavor. In this Game, you have to match the value of the cards from the pile with the ones on the table to make both disappear. There is a Joker that can mach any card. Your goal is to match all face up cards. The Undo button allows you to undo a wrong move.